Like the past 7 days in Kansai, Tokyo was pouring grumpily from day to night. In fact the wind was so strong that it broke my trusty black umbrella the night before at the cross-road of Shibuya. I took the JR line, transitted at Shinjuku Station and was immediately greeted by horrendous human traffic during morning rush hour. My mojo was depleting as I spent almost an hour walking up and down looking for Oedo subway line. 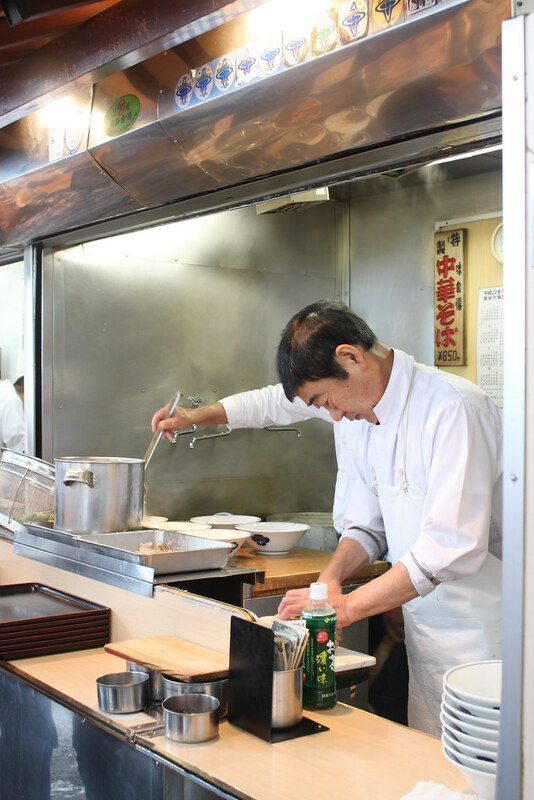 The station master was totally eigo wakarimasen and I was on the verge of giving up on my Tsukiji breakfast. Fortunately I didn't as my senses kicked in. I reached Tsukiji late morning and it was still pouring. I walked into a small cosy place and ordered a large bowl of don with my limited nihongo and sign language. It was quite an experience sitting at the bar counter, watching obasan and ojisan moving around the kitchen. 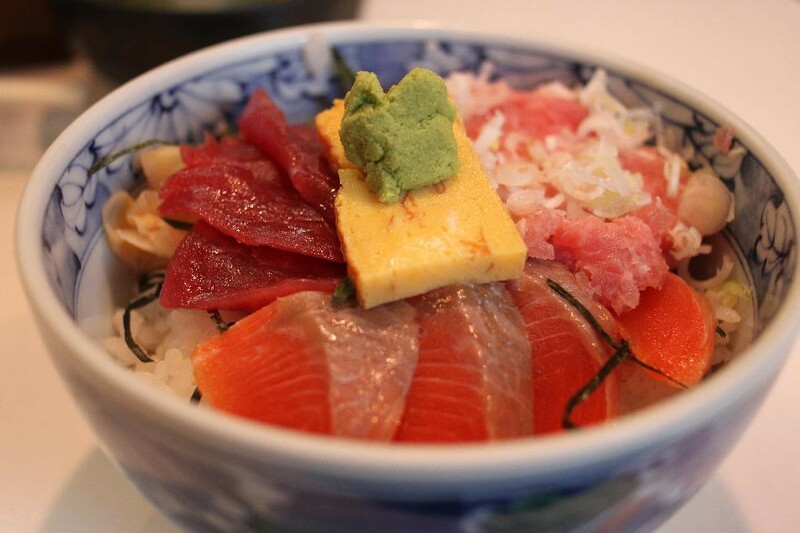 As expected, my bowl of maguro and sake don was lovely. I finished my food and handed over the empty bowl and teacup to obasan. Everything is self-service here. Obasan spoke a few nihongo words, but all I could say was ‘Nihongo Wakarimasen’. I should have picked up a few more words before leaving for this trip. I continued walking around Tsukiji in the rain looking for more food. 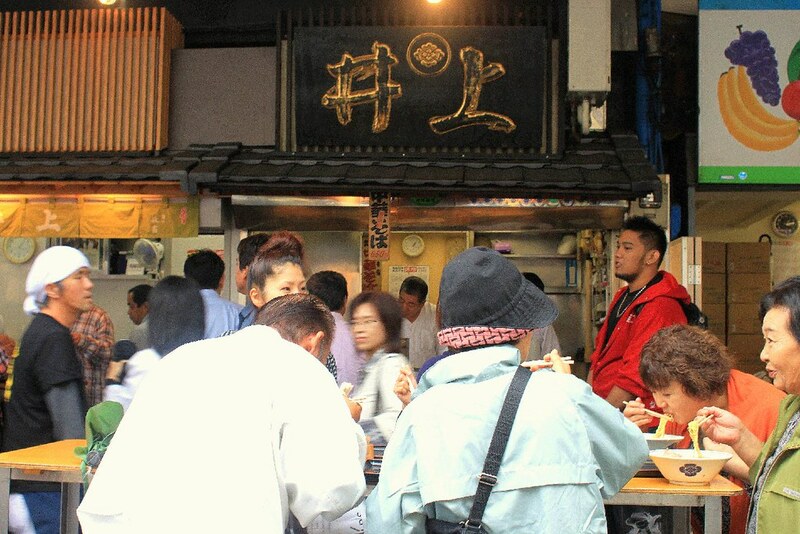 I passed by the long queue in front of a Ramen counter a few times and was tempted by the queue more than the food. It was Ramen by the way. I never liked Ramen, just like how I always shudder at Indian food. In the end, I succumbed to my kiasu spirit and joined the queue. There were two ojisans in the kitchen. One was cooking noodles and another one was slicing char siew. Beside the Ramen counter was a row of tables with no seats. 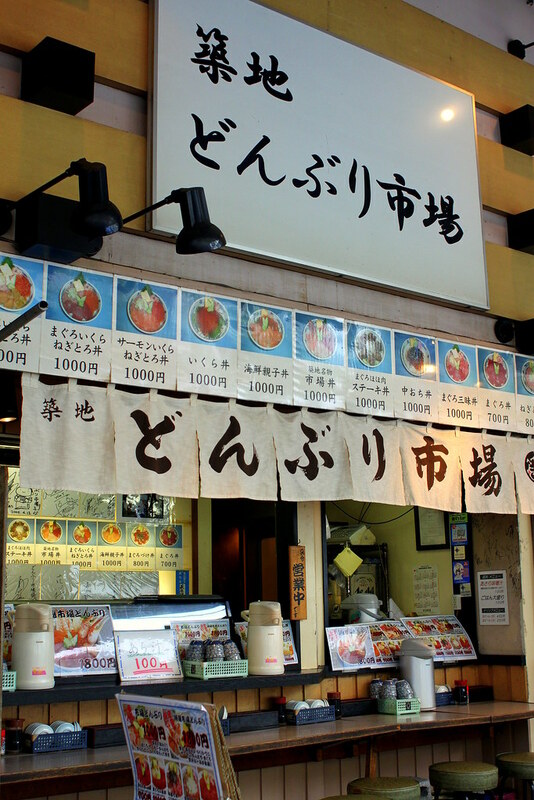 They only serve one (1) type of Ramen which is good for me, as I don’t have to use my private limited nihongo to order. I got myself a corner and slurped my bowl of Ramen with piping hot rich stock. I swear at that moment, I’ve forgotten that I wasn’t a Ramen eater. By the 7th day, I was deprived of Cantonese and felt like 'ching chong-ing' with them on the Ramen - "Hai Meh, Ngo Yi Wai Hai Jzu Guat Thong Lei Gah Leh" (Isit? I thought it is pork bone soup leh). Of course I didn't as the socio-phobia in me knocked sense into my head. Half way slurping through the noodles, I took out my blackberry, took a picture of it and sent to Hairy – the Ramen fanatic, while he was peeling his usual orange and kiwi combo for lunch in the office. I still kept this picture in my blackberry. Somehow I find it more appealing than my Gucci. Oh here's another unrelated but wondrous creation that I discovered. I was drying my clothes at the laundry room one night and saw this in the vending machine. 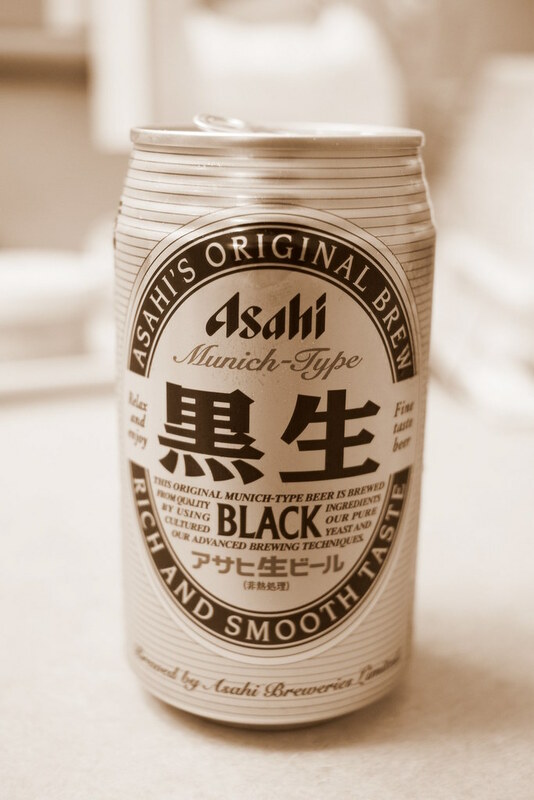 It is Asahi Stout, which is 200 times smoother than other ang moh brands. Too bad I've not been able to locate it in SG supermarts. 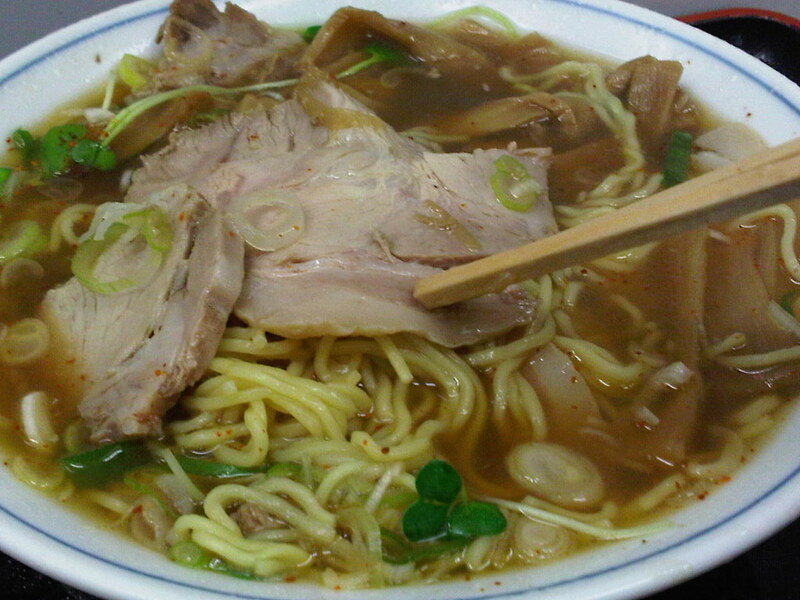 And guess what, my first dinner when I returned to SG was Shoyu Ramen at Parco. Sigh, I miss my Tsukiji breakfast. I miss my Tsukiji experience all the time. The sashimi's already good enough BUT they had to offer a bowl of simply delicious ramen too. Lucky you. 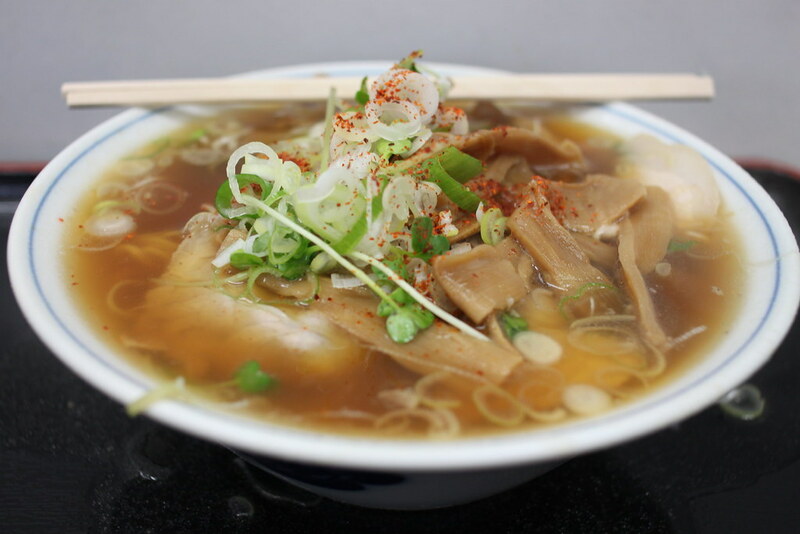 A few years back, the ramen shop was just a tiny stall by the road and we were standing and rubbing shoulders with the locals as we slurped. I liked that la, of course. Where's my J-stout, btw? Hmmph. The bowl of sashimi makes me drool because I love sashimi! This looks truly authentic! Great snaps! Japan...is love! I miss it! And ooh, how did I miss this post... You do really post once in a blue moon, dear... I look forward to more... Your 'mental' exchange in Canto with your fellow ramen breakfasters made me laugh out loud. Hehe. I heart sashimi too. I had it every single day during my trip...ahhh bliss.